Additional safety devices and rubber safety edges can be installed to most barriers to provide this form of safety with associated control equipment to stop and reverse the drive mechanism however can add substantial costs to the basic barrier. 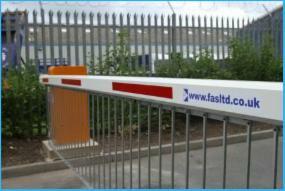 Also we are able to offer very long waranties on our torque motor barriers that we cannot offer on the standard barriers. We specify the torque motor barrier and the associated control equipment for many reasons the main ones being Reliability, Safety, Quality, and warranties we keep most spare parts for our products in stock at our main warehouse, we stock regular size barrier beams and can collect specials as needed. the barriers are so reliable that parts don't need replacing for very long periods, however we still carry spares enabling us to perform a fast and reliable repair and call out service for when they do get damaged. We also stock many parts for other manufacturer's products and get deliveries most days of the week also enableing us to offer a next day repair service. We carry out a wide range of service and maintenance contract work to keep your equipment working year in year out, we maintain and provide high levels of Preventative Maintenance Contracts on all makes and types of parking and security barriers, we carry such a wide range of spare parts for most barriers on the market we consider ourselves as probably the best service company in the midlands providing a service for barrier products around the UK.